Do you see how much time is spent online in the second process? Today, 90 percent of homebuyers start their searches online, and get fairly deep into websites, review sites and social media networks before ever stepping foot into a sales center. To capture these prospective buyers, it’s necessary to create online what have traditionally been offline experiences. On the most basic level, builders should have easily searchable information on their websites that any buyer would want to know upfront – the size of the homes, the options for floor plans, home features, community amenities, neighborhood facts, and information about the builder or developer. Where you’ll really stand out is if you’re able to drive the conversation about your community. This can be accomplished through blog posts and a strong social media presence, and even infographics, information guides and other content that answers questions homebuyers have about the buying process. Another channel to recreate offline experiences online is through email marketing. Onsite, you probably wouldn’t show a family of five your smallest floorplan, or a young professional a five bedroom estate, so why send irrelevant information to the prospects in your database? Take the information you’ve compiled about them via online registration forms and website analytics, and tailor your email campaigns with information you know they’ll want. Using an Online Sales Counselor (OSC) is another effective way to create positive experiences with your leads and prospects. This person is dedicated to nurturing online leads until they set an appointment, something most onsite agents simply don’t have time to do. An OSC replies immediately to all online leads, creates dialogue by exploring needs and answering questions, and provides relevant, timely information in a way the customer wants. 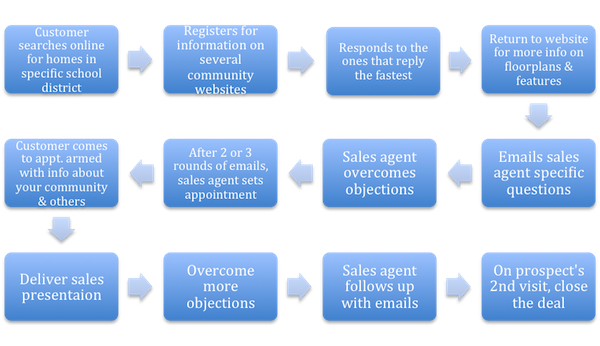 Don’t overlook the leads registering on your site, or the current prospects in your database. They spend much of the sales process online, so create online experiences that draw them in to what you invariably want – an onsite appointment with a qualified prospect who is interested in your community.